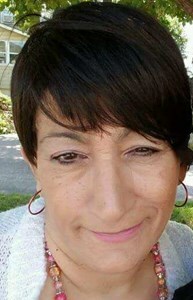 Michele A. Dickenson-Terino, 59, of Syracuse, passed away on Wednesday at home surrounded by family. Michele is survived by her Daughter, Teneka L. (Trevor) Harmon, Sons, Roberto Smith,Otis Smith; parents, Clement Jr. and Dolores Terino; six grandchildren, Nina, RJ, Alex, Khloe, Omar and Kennedy; 12 siblings; As well as many nieces and nephews. A memorial service will be held Monday, November 5th, from 2pm-3pm at New Comer Cremations & Funerals, 705 N. Main St., N. Syracuse with a sharing of memories to follow. To share a memory of Michele or leave a special message for the family, please click the Share Memories button above. Add your memories to the guest book of Michele Dickenson-Terino. My deepest condolences to my good friend JoAn and the rest of her close and extended family. Very sorry for your loss. Many, many memories of Michele and the Star Society Motorocycle Riding Club! She was always fun to be with and added laughter to the whole group. Our friendship extended beyond the club to our own circle of friends in the Jordan and Weedsport areas. Weekend BBQs, spur of the moment rides, trips to Niagara Falls. Lots of good times, rest easy Michele. Thanks for the memories. Our deepesty sympathy to Teneka, Otis and Roberto and all of those that loved her. I'm very sorry to hear of Michele's passing. My heart felt condolences to her family and friends. Michele always made me smile. Titi always gave me a kiss on my cheek when I saw her. My memories always go back to when we were so young. She brought music to our lives. Literally, the girl had an amazing record collection. We would play those 45's over and over. She brought the oldies and made them our's. We would sing like we were the back up for Roberta Flack. Heehee, not a singer amongst us. Always and Forever my love. One of my memories of Michele—“Micky” as we use to call her, was her getting ready to go apartment hunting...she took her time picking out just the right outfit and carefully laid them out on the bed. Next came the shoes, jewelry, and of course the purse! She would shower and put her make-up on, then came her famous “fro”...she would pick it out as much and as far as it would go! Next she would put on her carefully picked outfit and she was ready! She had her list of available rentals and off she would go! I use to love watching my big sister get ready to conquer the world of apartment hunting! She would return hours later with that grin of hers-she had succeeded! Will miss you so so much Micky! My favorite memories of my Titi Michele was the summer she shared her love of berry picking with me. We had the best time and hours would go by without us even realizing. I loved her laugh and I will miss her. Praying for my cousins, her children.